Hi, as the title suggests I am in need of some advice. I have been contacted recently by cabot about an alleged debt owing to a credit card, they have not bought the debt just acting on behalf of the credit card company. 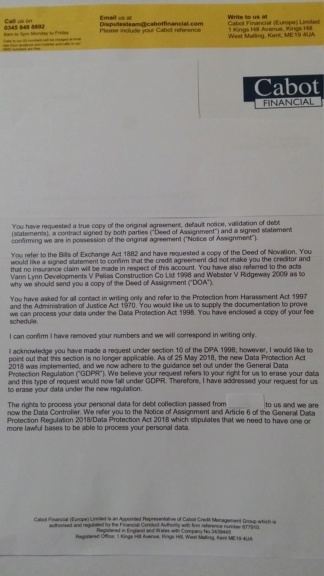 I have disputed this debt with other dca since early 2013 (cca and 3 letter each one ,no paperwork has ever been presented previously) and have had about the last 3 years of silence until now. My question is: should I bother to cca this dca first or just go straight to the 3 letters? :and do I use the new 3 letters? Yes start the new letters . Always better to rebut than ignore. Hi daveiron thanks for the quick reply. so just to carify, don't bother with the cca just fire the 1st of the new 3 letter at them? Yes up to you .If its worked before may as well use it again. Looks like its comeing up to be statute barred. just try to string it out . if you have been disputing the debt since early 2013 then i would guess that the last payment made was before then ? do you have any paperwork of your own for this ? eg a default notice issued by the original creditor ? are you sure this has not been sold ? unlike cabot to chase debts for anyone but themselves ? Send the letters for purchasers , If they have given you a timescale ,respond just before then. The letters require copy of default and assignment notices. so that will let you know the default date. Which i would guess is approaching the 6 years & thats why they have contacted you now. Play for time. it looks like a standard set up your account and pay form. 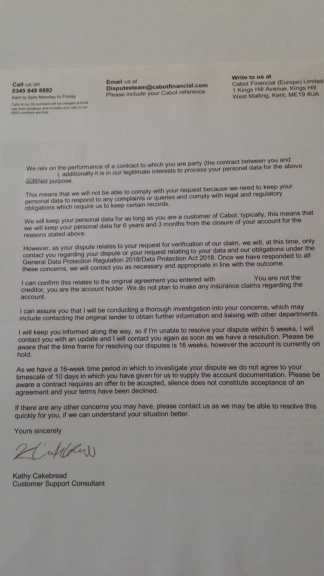 on a side note upon reading the form they are stating that they have bought the debt which seems contradictory to the cc company's covering letter which states the account has been assigned to cabot. does anyone know cabot ceo's name and address to put on the form? I dont know what form they have sent you .DO-NOT-USE-IT. sorry for my last reply I didn't make it clear, I was wanting the ceo name and address for the 1st of the 3 letters as that's what it is asking for to put on or should I just put cabots address and just to "dear sir/madam"
the only person refered to by name is Deborah green customer operations director. so cabot are now the new 'owners' of the debt. i am not sure what you mean by the disputed debt payment ? are you saying you made a payment against this debt in early 2013 ? If it were me and there was no stated return date on it then I would not return it. If they ever hit me about i'd say I spent all that time wondering when I should send it back but I couldn't make up my mind. @danta007 wrote: does anyone know cabot ceo's name and address to put on the form? cheers for the advice, ill wait until they sent another letter(probably be a nasty full of threats) before sending letter 1, string it out a bit. [quote="danta007"]cheers for the advice, ill wait until they sent another letter(probably be a nasty full of threats) before sending letter 1, string it out a bit. Its been over 2 weeks now and I haven't recived any other letters from them? ive had a couple of generic messages(no idea how they got my number) just stating please get in contact but apart from that nothing else. I would of thought they would have been on my case hard. should I just hang on and wait for a letter before sending letter 1(drag it out longer) or should I just send it anyway? 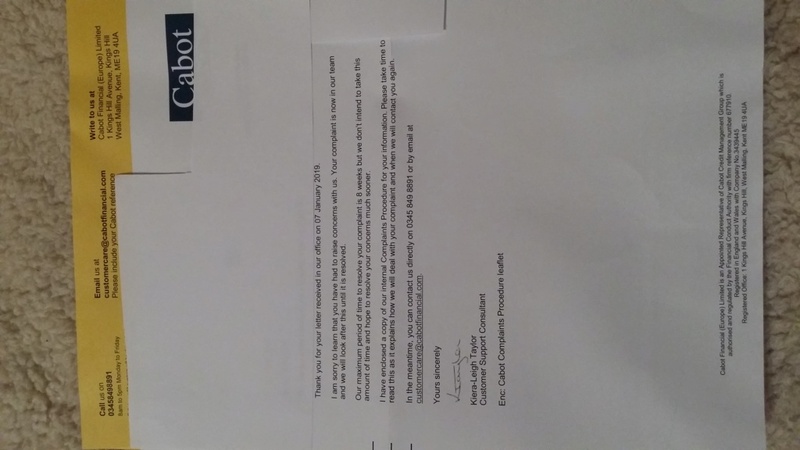 recived a letter off cabot. looks like a generic "we want to help you with your debt so please get in touch" letter. I had sent off the second letter and was just about to send them the third when this dropped through the letter box. i don't really know what there on about? should i just send off letter 3? Hi, Yes send the next letter. It appears one again that these low lives purchase these alleged debts with no documents to verify their claim. You will notice if you read the questions you asked them , they have just obfuscated the answers . Dave is right, just stick to the three letter system. The low lives play games / mince with your words / deliberately do not respond to specific points / will say stuff like “we are aware this is a template” (they use templates and who cares if it’s a template - facts are facts and the content ie documents we require are our entitlement...) / will say “we have checked with our legal department and recommend you seek legal advice” etc - blah, blah blah to SCARE you. Hi, Thank you all for the needed advice and encouragement it is most appreciated.